Following the signing of an agreement with the U.S. Government in late 2017, the Kingdom of Bahrain has officially become the first nation to procure the F-16 Block 70. The Block 70 is the latest F-16 production variant, which combines the advanced avionics and combat capabilities of the F-16V configuration with robust airframe enhancements, growing the legacy of the world’s most combat-proven, most affordable and most advanced 4th generation fighter. 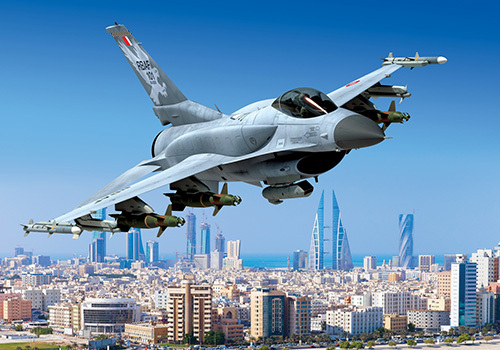 The announcement follows a contract award for Lockheed Martin Corp. from the U.S. Government to produce 16 new F-16 Block 70 aircraft for the Royal Bahraini Air Force. The Undefinite Contract Action award is the inaugural F-16 production program for Lockheed Martin since efforts began more than a year ago to move the F-16 production line to Greenville, South Carolina. This production line relocation enables expanded F-35 production capacity in Fort Worth, Texas--the traditional home of the F-16. These 16 F-16 Block 70 aircraft augment Bahrain’s current fleet of F-16 Block 40 aircraft. The F-16 Block 70 features advanced avionics and sensors including a proven Active Electronically Scanned Array (AESA) radar, a modernized cockpit, advanced weaponry, conformal fuel tanks, an automatic ground collision avoidance system, an advanced engine and an industry-leading extended structural service life of 12,000 hours. Worldwide, the F-16 continues to distinguish itself as the world’s most successful, combat-proven multi-role fighter. To date, 4,604 F-16s have been procured by 28 customers around the world. Approximately 3,000 operational F-16s are flying today with 25 leading air forces, including the U.S. and Royal Bahraini Air Forces. Prior to Operation Desert Storm, Bahrain was the first gulf country in the region to acquire the F-16 and, with its Block 70 acquisition, is now leading the modernization effort of regional air forces to acquire the most advanced 4thgeneration capabilities.